Migration is dedicated to crafting wines from the finest cool-climate winegrowing regions highlighting lush fruit, bright acidity and impeccably balanced oak. Since 1982, Charles Heintz Vineyard in Green Valley has emerged as a legendary site for world-class Chardonnay. Located atop the second ridge inland from the Pacific at an elevation of 900 feet, Heintz is a warmer vineyard in a very cool winegrowing region. This unique combination creates a gracefully balanced wine that combines the richness and intensity of perfectly ripened old vine fruit with the structure and acidity of great Sonoma Coast winegrowing. 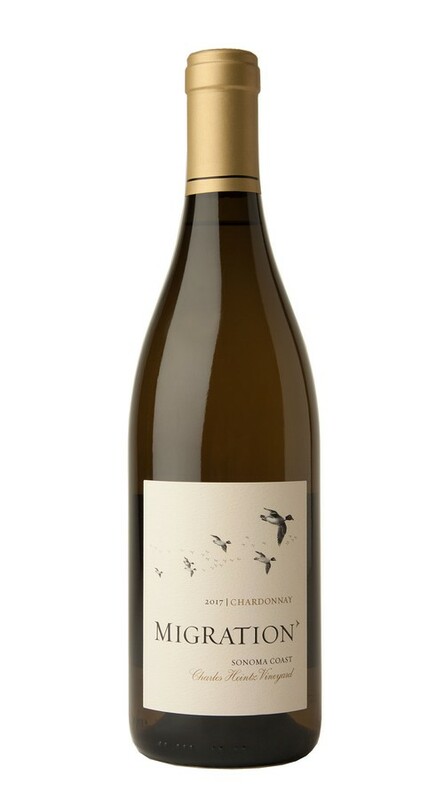 Rich, silky and impeccably structured, this wine shows why the old-vine Chardonnay from Charles Heintz Vineyard is so coveted. Aromas of sweet peach, honey and orange blossom waft from the glass, hinting at this wine’s depth and charm. On the palate, subtle notes of sweet vanilla and toasty oak underscore the lush fruit and add to a dramatic finish. 2017 offered idyllic growing conditions with plentiful winter and spring rains, which led to an excellent fruit set. While the summer was warm, with occasional heat spikes, healthy canopies and thoughtful pruning provided ideal dappled sunlight on the vines. Just as our Chardonnay and Pinot Noir were achieving ideal ripeness, a major heat event hit the valley. The result was an extremely brisk harvest with long nights of hand-picking and days full of sorting, destemming and pressing. While the pace of harvest was challenging, the fruit came in beautifully, fermented flawlessly and yielded wines with vibrant fruit and lovely acidity.